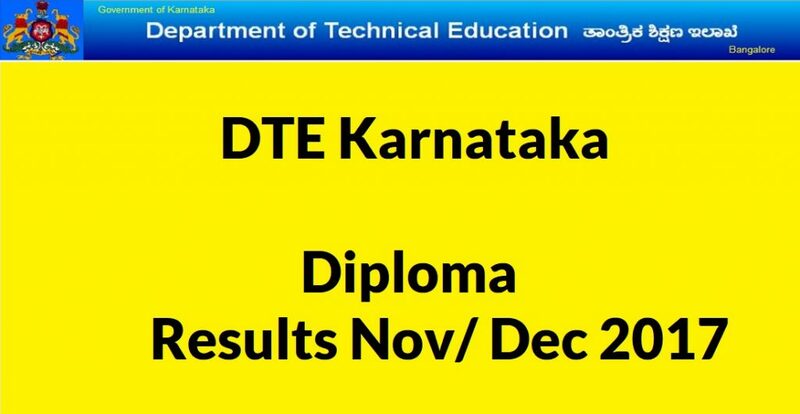 DTE Karnataka Diploma Nov/Dec Exam 2017 Results Declared for 1st/ 3rd/ 5th Sem @ dte.kar.nic.in Now: – The Board of Technical Examinations, Department of Technical Education of Karnataka State Government has announced the diploma examination results on this 25th January. The exam was held in November and December where the participants’ can check their result on their official media portal — bteresults.net and btestore.net. The details and information related to the DTE Karnataka Diploma regarding this revaluation process is going to available on the official media portal. All aspirants can start and begin applying from this 27th January 27 to see the last date and to remember the same only to submit the application form is 5th February. Aspirants and Students have to pay Rs 250 to apply for the revaluation. The Board of Technical Examination is responsible to conduct diploma/post diploma /tailoring examination and award diploma/ post diploma/ certificate to the eligible candidates. This DTE Karnataka Diploma was established in 1959 post a number of polytechnics and technical degree college’s increased in the whole state. The DTE Karnataka Diploma Exam Results November-December 2017 were scheduled to be come out today by the Board of Technical Examinations (BTE), Karnataka on its official website – btenet in, though, some website can be slow to give responding for the same. A notification on the official website of Directorate of Technical Education, Karnataka – dte.kar.nic.in is confirmed that the Diploma Exam Results November – December 2017 is all set to published on 25th January 2018, 3 PM. “Board of Technical Examinations ( BTE ) Karnataka Nov/Dec-2017 Diploma Exam Results On 25th Jan 2018 3.00 PM,” read the notification.